As the founder and Rabbi (senior pastor) of Messiah Echad, Jonathan Dade leads a congregation that: (a) serves Hebrew Christian, Torah Observant, Messianic Jewish, and Non-Religious Believers, (b) teaches principles on living a biblical lifestyle for spiritually-minded individuals, interfaith families, and non-religious couples, and (c) celebrates biblical feasts and holy days, keeps the seventh day Sabbath, and experiences the Holy Spirit. Theologically, Jonathan published The Church and The Community, pastored groups, researched the Scriptures, and received a Master’s of Theological Studies (MTS) from Colorado Christian University, with a passion (thesis) in Messianic Jewish apologetics, to a Christian audience. To get a feel for Rabbi Jonathan’s teaching style, we invite you to hear; Strengths and Cultural Intelligence, Suicide and Questioning God, Healthy Congregational Community, Interconnectedness of Scripture, Hearts United With God, and Loving Your Neighbor. On the secular side, Jonathan received a bachelor’s degree in biology from Prairie View A&M University, after which he spent some time in the U.S. Navy. He worked at Frito Lay and then at Michelin before attending Washington State University College of Business where he studied in the Executive Master of Business Administration (MBA) program. Jonathan did his capstone (thesis) on what eventually became RLB Echad, a faith-based consulting organization. His extensive research included: leveraging pastoral models to improve employee engagement, pushing work-life balance to prevent burnout, and encouraging nonprofits to seek experts in business. Jonathan, Melinda, Karissa (born 2011), Tristen (born 2012), the Rhodesian Ridgeback (Chaya), and a flock of mostly Buff Orpington chickens live in Georgetown, a suburb of Austin, Texas. * Outside of Jonathan’s unifying work with Messiah Echad and RLB Echad, he enjoys road cycling, target shooting, and visiting local wineries, usually— safely—in that order. Our Rebbetzin (Melinda) enjoys DoTerra Essential Oils, art, reading, and teaching younger women. And together, they enjoy archery, cabin camping, canoeing, cycling, foster-adopt discussions, and visiting local wineries. Should you ever find yourself in Central TX, be sure to contact Jonathan and visit Messiah Echad. *How should I pray for The Dades? – Deuteronomy 28:1-14… Favor given for obedience, and Value added to the community. Gather… men, whom you know to be the elders of the people… bring them to the tabernacle of meeting, that they may stand there with you… I will take of the Spirit that is upon you and will put the same upon them… Then the Lord came down in the cloud… and took of the Spirit that was upon him, and placed the same upon the elders; and it happened, when the Spirit rested upon them, that they prophesied… Oh, that all the Lord’s people were prophets and that the Lord would put His Spirit upon them! (Numbers 11:16-29). And this is a faithful saying: If a man desires the position of a bishop, he desires a good work. (I Timothy 3:1). And finally, our labor is never in vain in the Lord (I Corinthians 15:58), as even Moses could not do it alone. To repair the house of the Lord… they came to… Huldah the prophetess… they spoke to her… Then she answered them… “Thus says the Lord God of Israel… because your heart was tender and you humbled yourself before God… I also have heard you”… (Then) the king went up to the house of the Lord, with all the men of Judah and the inhabitants of Jerusalem… and made a covenant before the Lord, to follow the Lord, and to keep His commandments… with all his heart and all his soul (II Chronicles 34:8). Oh how our women can effect positive change for the Lord, as there is neither male nor female, for we are all one in Messiah (Galations 3:28) and few can teach the young women to honor Him, as another woman can (Titus 2:3-5). 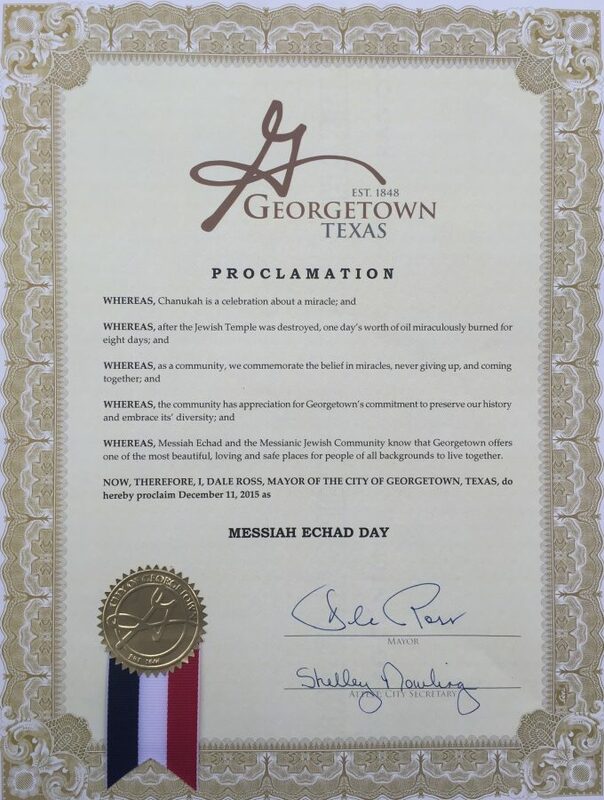 Messiah Echad, started as the 501(c)3 not for profit ministry founded by Pastor (Rabbi) Jonathan L. Dade in November of 2013, to serve the spiritual needs of Hebrew Christian (Torah Observing), Messianic Jewish and Non Religious Believers around Central Texas. Our primary focus was to be a fellowship who honored key principles from the old testament for theological, practical or cultural reasons, while also walking in the unconditional love and grace of the new testament. And to this day, we remain mindful of the biblical feasts, observant of the holy days (i.e. Seventh Day Sabbath) and respectful of the commandments, while also remembering that our Messiah upheld the law and gave us the ultimate commandment of love… but our ministry has grown much larger than Central Texas! And in April of 2015, we released our first of many albums, Awakened at Messiah Echad, which showcases our praise and worship. So join us for fellowship and consider allowing Messiah Echad to be your apostolic, charismatic covering that is messianic and scripture based. To serve Hebrew Christian (Torah Observing), Messianic Jewish and Non Religious Believers, by showing people how to love God (Deuteronomy 6:5), love their neighbor (Mathew 22:39) and love their Savior (John 14:15)… we exist to serve, show, and love, globally. We believe in the God of Abraham, Isaac, and Jacob, known as Elohim, El Shaddai, Adonai, Elyon, or simply, Yahweh. We believe in the Son of God, Born to Joseph and Mary of Nazareth, known as Yeshua (Jesus), or simply, Messiah. We believe in the Holy Spirit or Ruach Hakodesh, a Gift from Yahweh, made of nine manifestations that transform lives. We believe Messiah died and was raised again, to give us everlasting life and an intimate connection with the Ruach. We believe in a second birth through the Blood of Yeshua and a manifestation of that new life, by following His Commandments. We believe in One Body (Echad), made of Christian, Jewish and Non Religious Believers, worshipping together in love (UNITY). We believe in membership that is based on the wholly inspired Word (66 Books), calling us to tithe, serve, love and be genuine. 16 April 2018, Austin, TX – Jonathan Dade – A Texas Challenge Hug; Austin Statesman Article. 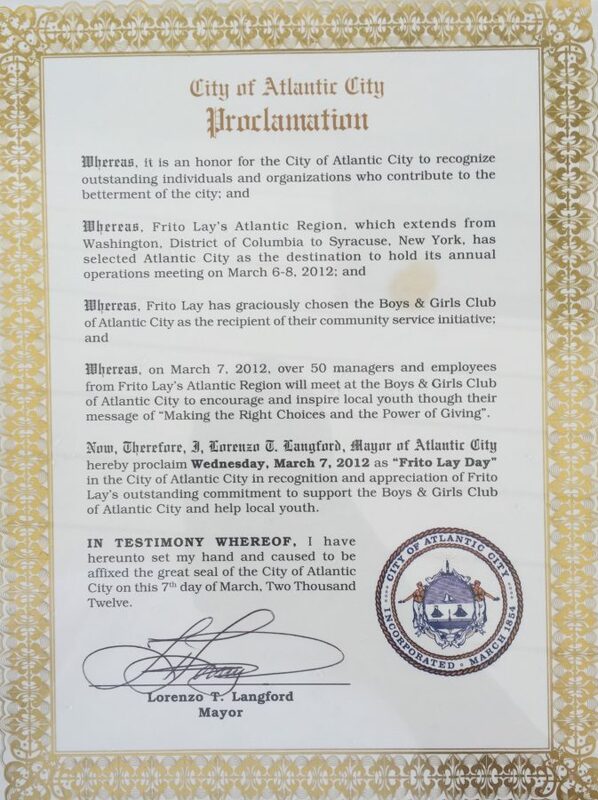 Print Copy. Extra Photos. 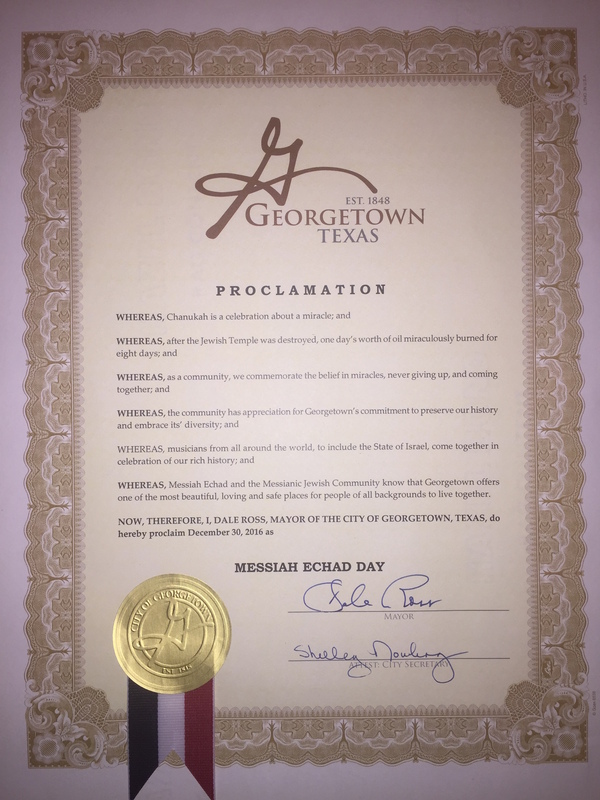 13 September 2017, Georgetown, TX – Jonathan Dade – Religious Leaders Ask; Reconciliation Through A New Statue?